These Fiat 500 Mats in Carpet are a great addition to any Fiat 500 they allow protection to the Fiat 500's foot wells, as well as adding style. These Fiat 500 Mats in Carpet are a great addition to any Fiat 500, they allow protection to the Fiat 500's foot wells, as well as adding style. The Front Fiat 500 Mats are both personalised with the Fiat 500 logo, and the drivers mat includes a fixing stud to prevent movement. Our Fiat 500 Mats are available with the following Stitching and Edging, which allows your choice of Fiat 500 Mats to match the interior of your Fiat 500. 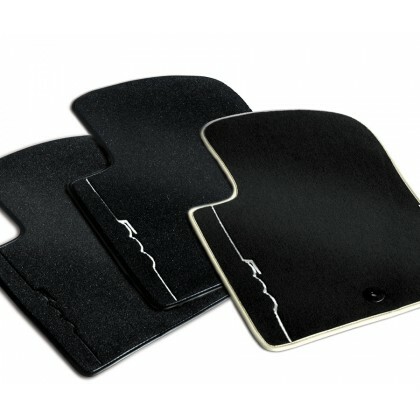 These Mats also have velcro underneath to ensure the mats are secure in the footwell. These Fiat 500 Mats will fit vehicles that come with one fixing in the foot well of the car. Newer Models of the Fiat 500 Vehicles now come with two fixings in the driver's side foot well. Please see our other listings for Mats with Twin Fixings. Therefore to fit these Fiat 500 Mats for vehicles with two fixing studs we strongly advise that you should visit your local Fiat Retailer who will be able to fit the Fiat 500 Mats correctly. Will these Mats fit my Fiat? These Mats are suitable for Fiat 500 2008 - (September ) 2012 Models. If you are still unsure whether these Mats will fit your car then please click here to email us with your Chassis Number.